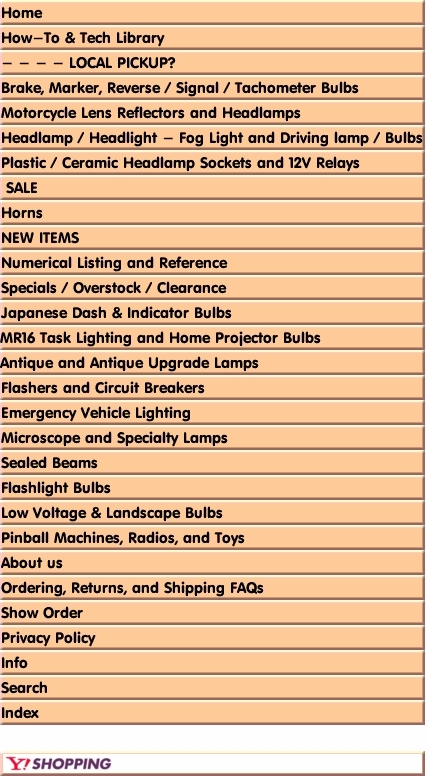 Welcome to our complete bulb listing. We strive to keep most items in stock, however, not all or our listing is available immediately, and may cause delays in shipping. -ALL SEALED BEAM PURCHASES MUST BE MADE USING A CREDIT CARD. LASTLY, SOME TYPES MAY NO LONGER BE AVAILABLE WITHOUT LONG DELAYS OR THE ITEMS ARE IN A NO STOCK STATUS. WE WILL MAKE EVERY EFFORT TO FULFILL YOUR ORDER, BUT YOUR ORDER WILL BE CANCELED -- OF COURSE WE WILL CONTACT YOU PRIOR TO CANCELLATION. Please be sure to include your daytime contact number, or an active Email account should the need arise to contact you concerning your order. No Free Shipping on Sealed Beam Lamps, Horns, or Motorcycle Lens Reflectors. These items are too heavy for 1st Class Postal shipping. Please select Priority Mail or UPS selections as your shipping choice.